Wader Quest: The world of stilts. 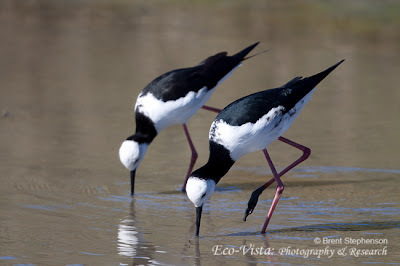 The Himantopus stilts are elegant birds, they adorn any wetland they visit with a certain grace and beauty as they potter around the water's edge looking for food. Black-winged Stilt: King's Project, Lampakbia, Thailand, November 2012. Taxonomically they are less agreeable. Some regard them as being just two species (HBW 1996), the global black and white stilt known as Black-winged Stilt Himantopus himantopus and critically endangered Black Stilt H. novaezelandiae even then the latter was considerd a colour morph of H. himantopus by some (Oliver 1930). I say disagreeable because there is still no universal consensus as to the taxonomy of these birds. More recently they have been divided up into to six species. Black-winged Stilts: King's Project, Lampakbia, Thailand, November 2012. We at Wader Quest decided we would adopt the following six species of stilt: Black-winged Stilt H. himantopus, White-headed Stilt H. leucocephalus, Black-necked Stilt H. mexicanus (to include H. mexicanus knudseni) and White-backed Stilt H. melanurus, Black Stilt H. novaezelandiae and of course the non Himantopus odd man out Banded Stilt Cladorhynchus leucocephalus. Once again this is not an attempt to justify any particular taxonomic stance, merely a convenient way to record the birds we have seen around the world. Juvenile Black-winged Stilt, with adult (sitting) and Pied Starlings Sturnus contra: King's Project, Lampakbia, Thailand, November 2012. Black-winged Stilt is by far the most widespread of the species breeding right across Europe and Asia as far as central China and winters around the mediterranean, central and southern Africa, India and parts of south-east Asia where it is also resident. We have so far seen them in Thailand and in the UAE. Black-winged Stilt: Salt pans Pak Thale, Thailand, November 2013. White-headed Stilt is also known as Pied Stilt, I suppose that white headed is not the best name as Black-winged Stilt has an all white head where White-headed Stilt doesn't! Still, Pied Stilt doesn't help much either if you think about it as they are all pied to a greater or lesser degree. 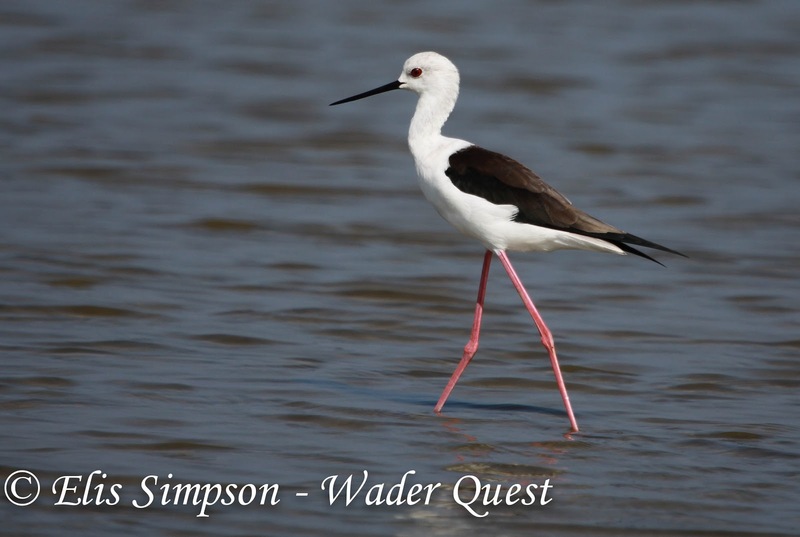 We have yet to see this species on Wader Quest as we are not due to travel to Australia and New Zealand until September, however we did see them there on our visit in 2004. 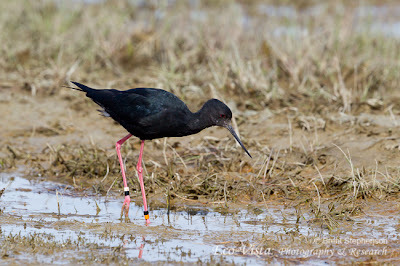 It is this species that hybrideses with Black Stilt in New Zealand. 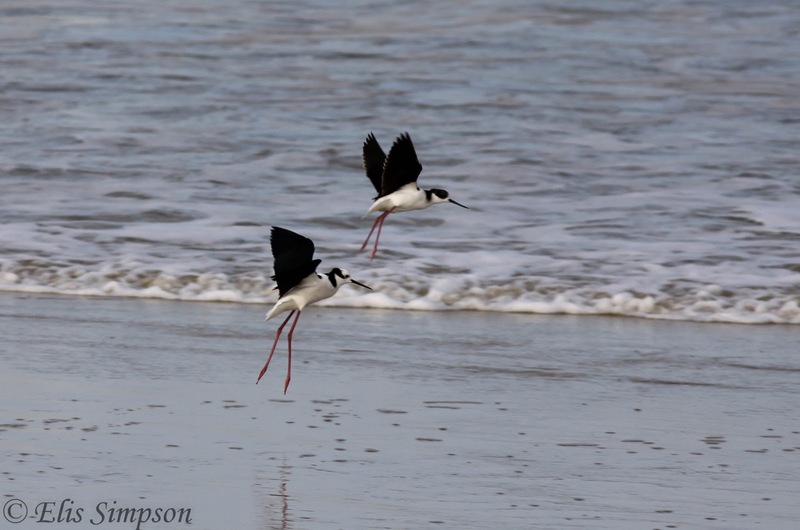 White-headed Stilt: New Zealand, location and date unknown. Photo Brent Stephenson. In North America and northern South America the Black-neckd Stilt breeds. In the north of its range it is a summer migrant. This bird we have seen across the USA on our travels and also in northern Brazil in the past. 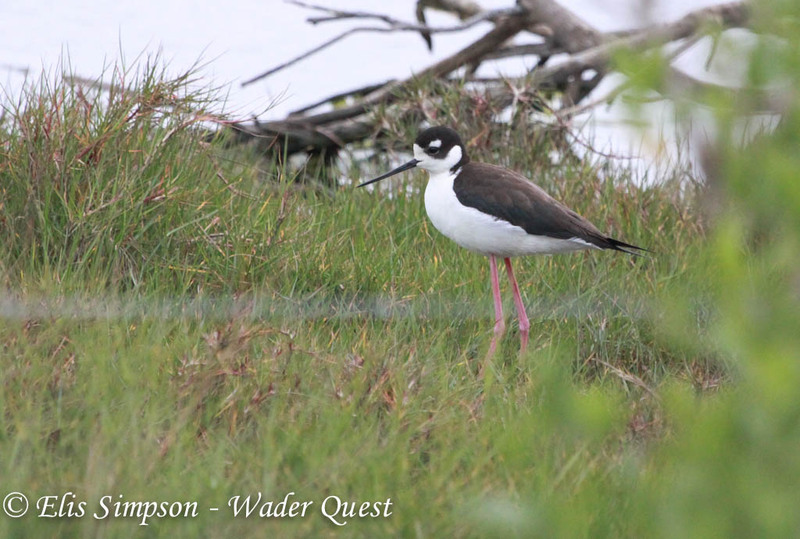 Recently we came across one that had seemingly paired with a White-backed Stilt H. melanurus to produce hybrid young. Black-necked Stilts: Salton Sea, California, USA, November 2012. Black-necked Stilt: Welsh, Louisiana, USA, April 2013. Probable Black-necked/White-backed Stilt hybrid 2: Fazenda Brejinho, Pirapora, Minas Gerais, Brazil, June 2013. White-backed Stilt: Fazenda Brejinho, Pirapora, Minas Gerais, Brazil, June 2013. This was the individual that was probably paired with the Black-necked Stilt above to produce hybrid offspring, also above. 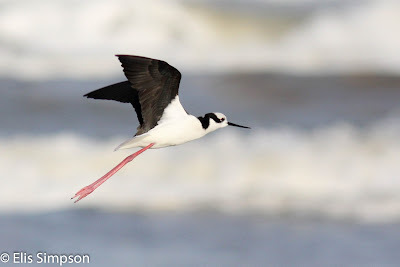 The southern stilt of the Americas is the White-backed Stilt, this was the bird we used to see regularly when we lived in São Paulo but on Wader Quest the only one we have seen is the bird that appeared to have formed a hybrid pair with a Black-necked Stilt in western Minas Gerais. White-backed Stilt: Tavares, Rio Grande do Sul, Brazil, June 2011. Adult (left) and Juvenile White-backed Stilts: Tavares, Rio Grande do Sul, Brazil, June 2011. That brings us on the the Black Stilt. This of course we have not yet seen but it is one of our major targets for New Zealand when we get there. There are thought to be less than twenty pure birds left after the hybridisation started in the 1960s, however the population is increasing slowly with constant and inrense mangement of the conservation effort. The hybrids produced are not particularly successful breeders, so the hybrid population is not advancing as quickly as feared and suturating the pure population. Numbers have increased due to a captive breeding programme releasing many individuals into the wild. Black Stilt: New Zealand, location and date unknown. Photo Brent Stephenson. 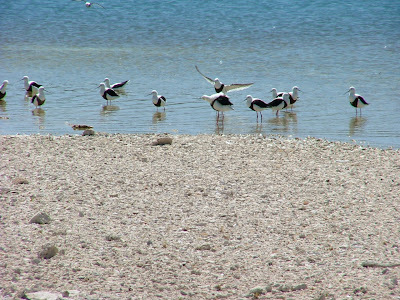 The Banded Stilt has a genus of its own Cladorhynchus. This bird seems to fit between stilt and avocets with its slightly upcurved bill. We hope we'll get to see this bird in Australia, but it is by no means certain, we will be mostly out of its range on right on the edge of it. We did see them in 2004 when we visited Western Australia, they are superb birds and I really hope we get to see them again. Banded Stilts: Rottnest Island, Western Australia, Australia, October 2004. 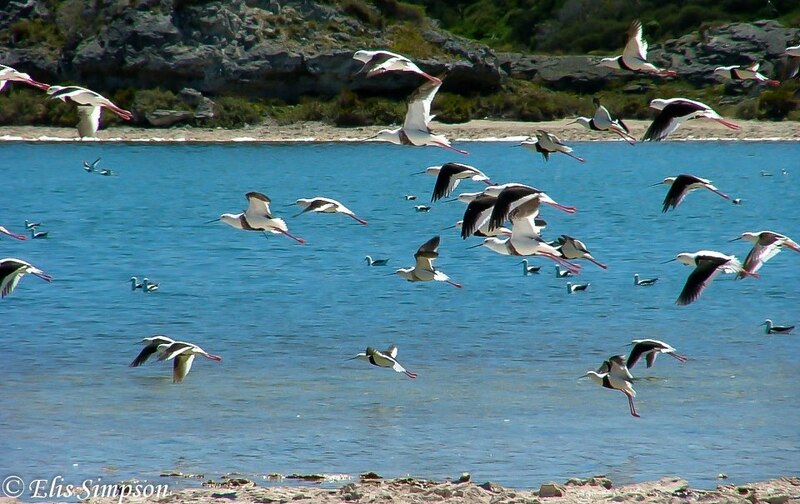 Banded Stilts: Rottnest Island, Western Australia, Australia, Australia, October 2004. I think it would really be helpful to be a little more precise as to the locations where you saw these birds. Locations such as USA, Brazil or Australia provide scant information indeed. These countries cover vast areas and you must surely know where you saw the birds. Point taken, the photos were meant just as illustrations of the different forms but I'll add the information you suggested if you'll find it useful. I have been following this blog closely since I came across it and would find this information both interesting and useful. Thanks for your interest in the blog david. I have added the details you suggested and will endeavour to continue to do so (where known) in future. If you ever need any specific information about where and when we have seen anything please feel free to email us and we'll be happy to share whatever information we have with you. Thanks for your comment Kerri. These are among the most elegant of birds for sure.